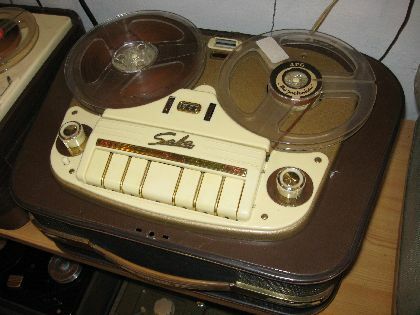 This is the first product of a famous german firm, the Saba, in 1953. It has vacuum-tubes. The knowledge of this old machine is a big surprise. In the 19,05 cm/s tape speed the frequency response is 20 Hz – 20 kHz, and the dinamics is 58 dB! You can hear it, from the built-in loud-speaker.